The Chihuahuan Desert Gardens is a botanical garden dedicated to the flora of the Chihuahuan Desert and adjacent regions in the United States and Mexico. The Gardens were formally dedicated in September 1999 and currently contain over 625 different species of plants, thus comprising one of the largest captive assemblages of Chihuahuan Desert flora in the world. 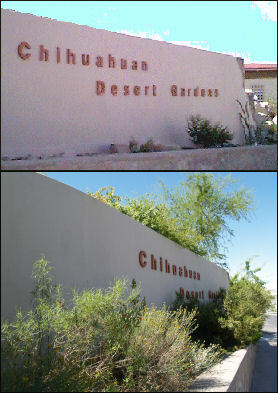 The "before" photograph to the right was taken shortly after completion of the Chihuahuan Desert Gardens construction. The "after" photograph was taken in May 2006. Many of the Gardens plants have information and photographs available in the Centennial Museum's Chihuahuan Desert Plant Database. Since the database is concerned only with individual kinds of plants, overviews and general information regarding the Gardens are given on this and associated pages. 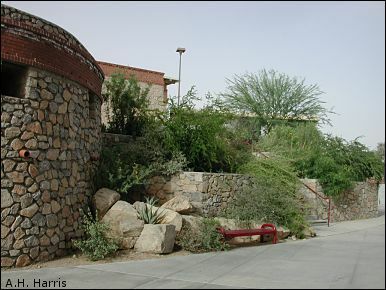 The Chihuahuan Desert Gardens consist of a number of adjacent gardens designed to show the attractiveness of native desert plants for landscaping, demonstrate landscaping techniques that conserve water in this desert region, and serve as a resource for both formal and informal botanical and environmental teaching. Ultimately, we plan to have images and data on each kind of plant in the gardens available in the database. By its very nature, a botanical garden complex is always a work in progress; however, a significant portion currently is online. Stop by often and see what has been added since your last visit. The gardens are the result of the vision and hard work of Wynn Anderson, the Centennial Museum Botanical Curator, with the aid of people too numerous to mention by name. 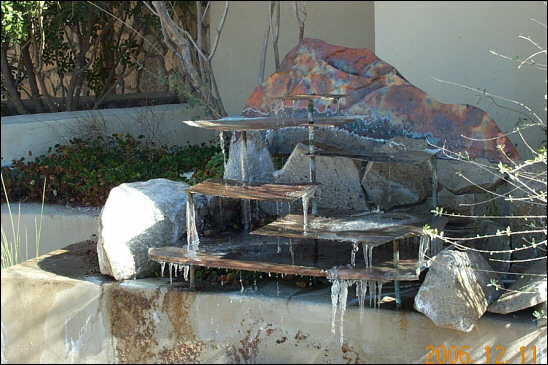 The Sensory Garden fountain in winter. Photograph by Alicia Gonzalez. The gardens are located on the Centennial Museum grounds and in the immediate vicinity, with the main gardens lying to the west and southwest of the Museum building. The garden plan (147K) is available as an image map leading you to the various individual gardens; alternatively, use the menu to the left, where clicking on an underlined item will take you to that page. Printed tour guides are available. The first is for people who want a General Tour, but are not particularly interested in an extended description of the various Garden features; this also is available en Español. 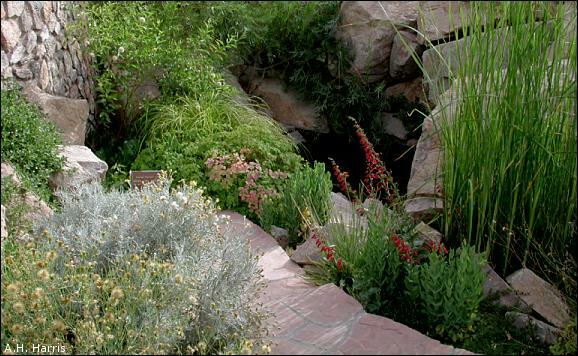 The Extended Chihuahuan Desert Gardens Tour Guide goes into more detail and is aimed more at the avid gardener. These guides are in PDF format for accurate printing. Information and images about individual kinds of plants can be accessed from the database. Jane SpottedBird has gathered ethnobotanical information on some of the garden plants which can be accessed from individual plant accounts, or the entire paper may be recovered as a pdf file (Ethnobotany). A pdf reader is required to access the latter, but a free download of Adobe Reader is available. The thumbnails below will take you to views of several portions of the gardens as they were in August of 1999. As the gardens mature, proportions fall into place. The thumbnails below will take you to views taken in June 2000.